My mother is an avid reader. Our small home in Spain was filled with books, mostly mysteries. I grew up watching my mother read them, then, followed suit. My first real taste of cozy mysteries were the Nancy Drew books, then, I moved on to Agatha Christie, and Georgette Heyer. I knew from early on that I’d one day write. 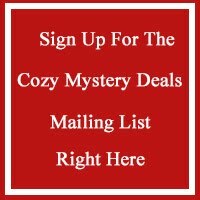 I figured cozy mysteries would be part of my writing journey. I now also write psychological thrillers and romantic suspense under pen names. I guess, it’s all things mystery for me. Tell us a little about the Mercy Mares series. Mercy Mares is a character I developed to pay homage to all the wonderful nurses, nurse’s aides, medication aides, and everyone who has worked in the healthcare industry from the hands-on caregivers to the cleaning and support staff. I was a hospice nurse for twenty years. I moved up through the ranks and met so many wonderful patients, families, and medical professionals. Mercy shares traits with many of the guys and gals I worked with, learned from, and had the honor of calling my friends. Also, tell the readers about the Missy Rae series. The Missy Rae series is a character created with my daughter in mind. She’s technically a witch – by name only. But beyond that, she’s a young adult who hasn’t quite figured out where she wants to go in life and hasn’t yet come to terms with all the great gifts she possesses. I adore her because while writing about her foibles, I find myself learning about life, love, and learning to be yourself with her. In addition, tell readers about the Jinx Cove series. Jinx Cove is the brainchild of my friend Savannah Mae. She’s had this story to tell, but like many writers, doubted herself. After a four-year-long battle with breast cancer, she decided to finally write the book she carried with her for years. Her world is about a group of hapless witches, some young, some old, all not very good at the whole witch thing. They make a lot of mistakes, make their problems so much bigger, and yet, somehow, get themselves out of binds by the skin of their teeth. She wrote the first book in that series. I volunteered (begged) to co-write the second and third book in that series. We decided to intro a few of my characters to her world. The first co-written book is Missing in Jinx Cove. It was tons of fun to write. We’re currently working on book three, the final book in that series. The title is Murder in Jinx Cove. Again, it will include cameos by a few of my characters. I have in some ways, albeit without tripping over any dead bodies or witnessing any heists, but mildly similar. Some of what Mercy says and does are very reminiscent of a certain former hospice/dementia care unit nurse manager. Wink. Wink. I’d be her for an adventure or two and then I’d have to bow out because my children would miss me. Hands down, my favorite character is Nubbin Schmeckpepper. I LOVE him! He’s cranky, feisty, and big, old teddy bear all at the same time. I love every silly word that comes out of his mouth. I love the way he holds absolutely nothing back. He’s the best! So many! It’s so much fun hearing fans, especially former healthcare workers, tell me how this or that happened to them or someone they worked with. Those are the best stories ever. Patients going MIA. Check. Missing medical charts. Check. Lazy coworkers. Check. Forced overtime. Check. Working super short-staffed. Check. You name it, it’s happened. In a dream world, I’d read books for a living. Yes, please! My first instinct is to say Mercy & Mayhem. When I wrote it, I absolutely loved it, but now, some four years later, I have to say it’s one of the books I’m currently writing. It’s a cozy mystery that I’m contracted to write for Sweet Promise Press. I’ve wanted to write the characters in this book forever. I can’t wait until I can share this book with the world! I am a binger. I binge read books, binge watch dozens of shows on streaming services and on cable channels and I have an addiction to planning. Give me stickers, Washi tape, markers, and all-things-planning and I’m a happy girl. I speak three languages fluently – Spanish (Catalan), English (American), and Italian (Because why not?). I have several books in different stages of production. I am two books away from completing the Mercy Mares series. I’ll be introducing three new series later this year in my cozy mystery and sweet romance series and I have six (seven?) new thrillers to be published over the next year. You can say, I have lots in store for the foreseeable future.